It has been a long time coming since I’ve had a normal skincare routine. Once my Cushing’s came on full-blown, there was absolutely nothing that could save my skin. It was dry, rough, thinning and getting worse day-by-day. When I had surgery at the end of January, my skin became even more red and blotchy on my face and my skin was still a little rough on the rest of my body. At that point, it felt like I would never improve. I felt better physically, but my skin was horrible. Recently, I’ve been able to slowly get back into a routine. My skin isn’t perfect still, but it is back to being soft and clear. I’ve had eczema my whole life, so I will always have dry skin but nothing like it was before. The skin on my face is incredibly delicate still and I get tiny dry flakes of skin coming off. It’s incredibly frustrating and even with proper cleansing, exfoliation (very light), and moisturizer – my skin still flakes and foundation? Impossible to put on without it looking like my skin could be peeled off easily. I set off on a hunt this past Saturday to look for a good facial moisturizer and I found one. 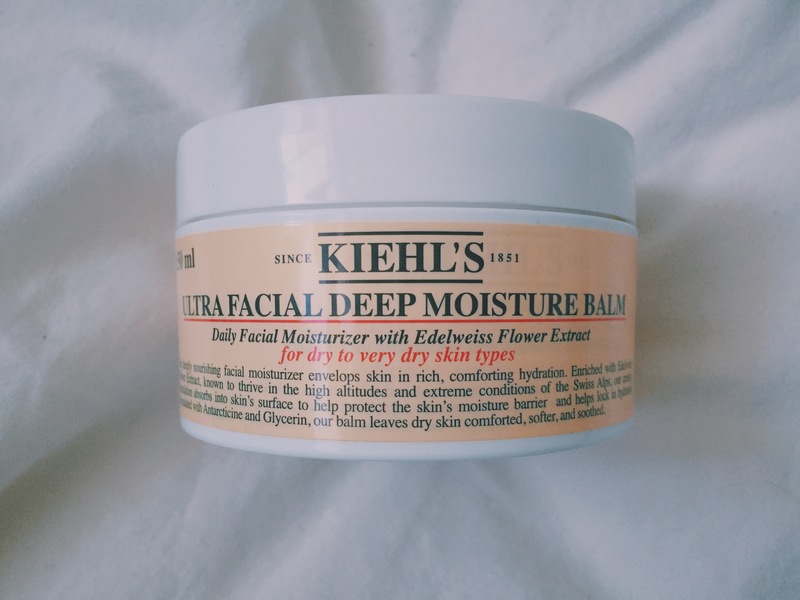 After cleaning my face with African Black Soap, Kiehl’s Ultra Facial Deep Moisture Balm is to the face what lip balm is to lips. This is a bit thicker than normal moisturizer, but it works magic. You don’t even need to slather on a ton of this product because a little goes a long way. I usually use a dime sized dot for each section of my face (cheeks, forehead, chin, etc) and it does what it has to do! It is gentle enough to use day and night. I love how after putting this on before bed, I have soft skin when I wake up. I can’t find many moisturizers that do that for me. Kiehl’s is pretty pricey and I’m usually on a budget, but for 150mL at $67.00, it’s a no brainer. Kiehl’s products last months as opposed to me buying drugstore products at $15+ every 1-2 months because I have to use so much of a product that doesn’t work for me. In the end, I have a great moisturizer that works and I don’t need to go shopping for cream every couple of months! Now, one thing I didn’t mention about putting moisturizer on at night was that I try not to put moisturizer on troubled spots aka zits. When those pesky bumps appear, I love to use Lush’s Grease Lightning. This is a tea tree based spot cleanser where a little really goes a long way! Squeeze a little bit onto your finger and dab it onto your trouble spot. Sometimes it “burns” for a couple of seconds as the oils sink into the acne and kill the bacteria, but it leaves the spot(s) feeling fresh and clean! After I’ve taken care of my face, I move onto the rest of my body. 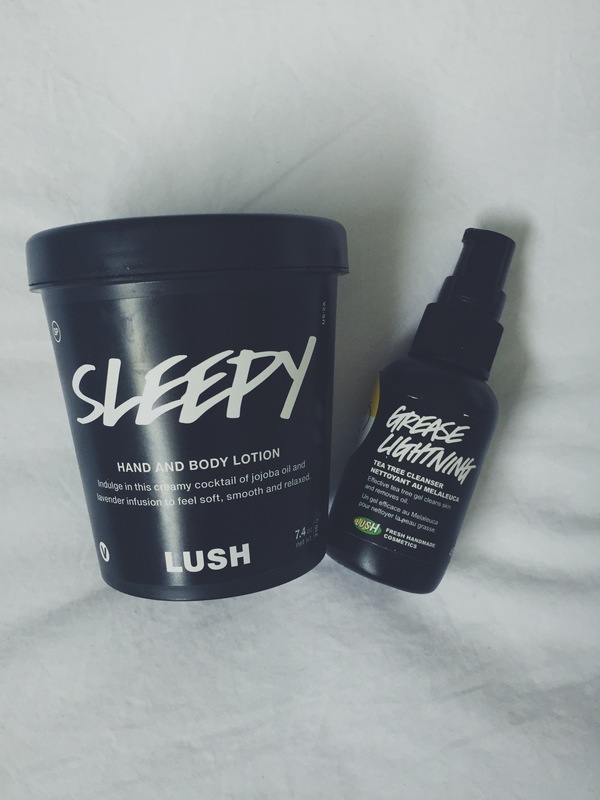 For Christmas, I got myself “Sleepy” from Lush. Unfortunately, this is a seasonal product so it isn’t for sale currently. Sleepy is lavender based so it helps you feel a sense of calmness. Quick side note: Did you know lavender works in whichever way your body needs it to? Meaning lavender can also be used to give you a sense of energy. Breathe in some lavender essential oil no matter what you’re feeling – your body will respond to the aromatherapy in whichever way it needs! 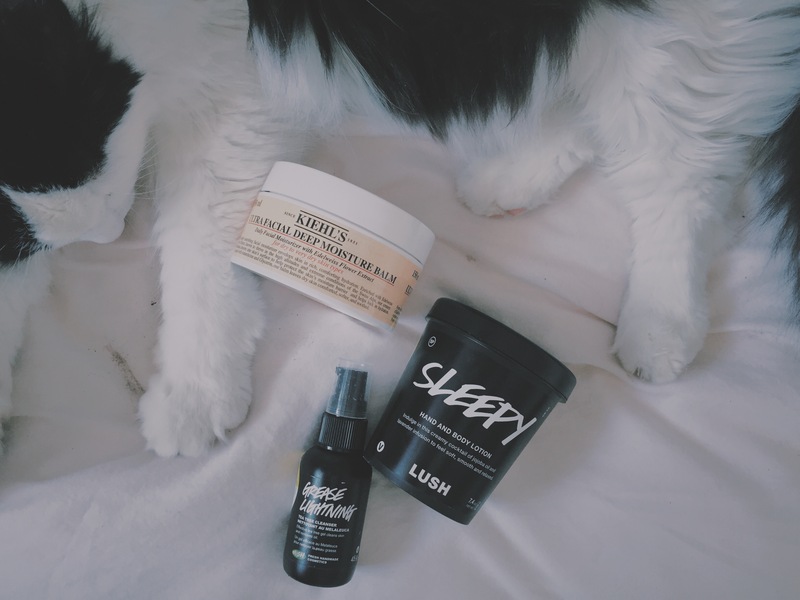 “Sleepy” also contains jojoba oil which is amazing for your skin. It’s better than coconut oil, too! No clogging your pores, no risk of more acne. Try out jojoba oil or even almond oil! I promise – you’ll love it! I’ve always had extremely dry skin, with occasional red patches, and it seems like it took an eternity before I finally found the right products for me. I’m currently using a mix of Lush, Kiehl’s and Simple and it is definitely working out for me. It’s incredible what the right products can do. Very interesting read. I’m definitely going to look up that Kiehl’s balm, nothing beats a good moisturizer during those winter months. Would you be interested in featuring this post on Creators.co? I’d really like to see your work on the platform. Feel free to shoot me an e-mail for more information. I’d love to hear from you. All the best!